Live in Hialeah? Want to see if a Payday Loan is right for you? Let the facts help you decide. People everywhere, including those who live in Hialeah, have heard the term Payday Loan. Here at Amscot, we call it an Amscot Cash Advance* and for a very good reason. While some providers give you a check you’ll have to cash elsewhere, our approved Cash Advance customers walk out with cash in their hands! It doesn’t get more convenient than that. You could get up to $500 in minutes. No hassles. No credit checks. What makes an Amscot Cash Advance (Payday Loan) a smart financial tool? Not only is it fast and convenient, our service often costs less than late fees on an overdue bill. Below are some links to help you make a decision on what’s right for you. Or, simply click the "Get Started" button on this page. If you live in Hialeah, see why your neighbors choose Amscot Cash Advance! Our approval process is quick, and you can walk out with real cash. We charge less. In fact, Amscot has some of the lowest Payday Loan fees in the industry. View APR/Fee Schedule. We’re there when you need us, 365 days a year, and some locations are open 24 hours. Simply fill out our short Cash Advance application, sign an agreement, and write us a check for the payday loan amount plus the fee. We’ll give you cash on the spot and hold on to your check until your next payday when you’re due to repay. How much does this service cost? Amscot charges a flat, one-time fee, and it’s one of the lowest payday loan fees in the industry. Learn more about Payday Loans. 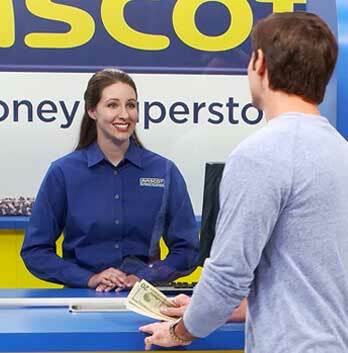 Amscot offers more than just Payday Loans ... a whole lot more. We’re called The Money Superstore® for a reason. In addition to an Amscot Cash Advance (payday loan), you’ll find an extensive menu of convenient financial services. Check cashing. Free money orders. You can pay your bills electronically. Wire money. Send a fax. Make copies. Buy stamps. And use a well-lit, accessible ATM inside the branch. You can even obtain and load an Amscot Prepaid Mastercard. Need something notarized? No problem! Each branch has a notary on-hand 365 days a year, early to late – and we even have 24-hour locations for added convenience.